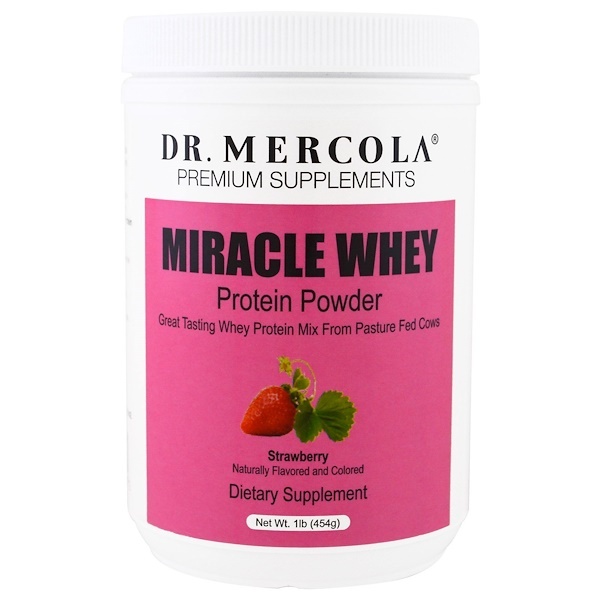 Made from only the finest cold pressed, pasture fed cow whey protein concentrate, Mercola Miracle Whey Protein Powder is the perfect blend of one of the most nutritionally -complete, all-natural protein products available. Guaranteed to please your palate, this fantastic tasting protein mix is power-packed with the complete spectrum of amino acids your body needs for quick muscle recovery after a brisk workout. Plus, because you need extra amino acids as you age, Mercola Miracle Whey Protein Powder gives your body the extra boost of nutritional energy it needs. Mix two scoops (40 g) with 8 oz water or milk until desired consistency if reached. May be taken two to three times daily. 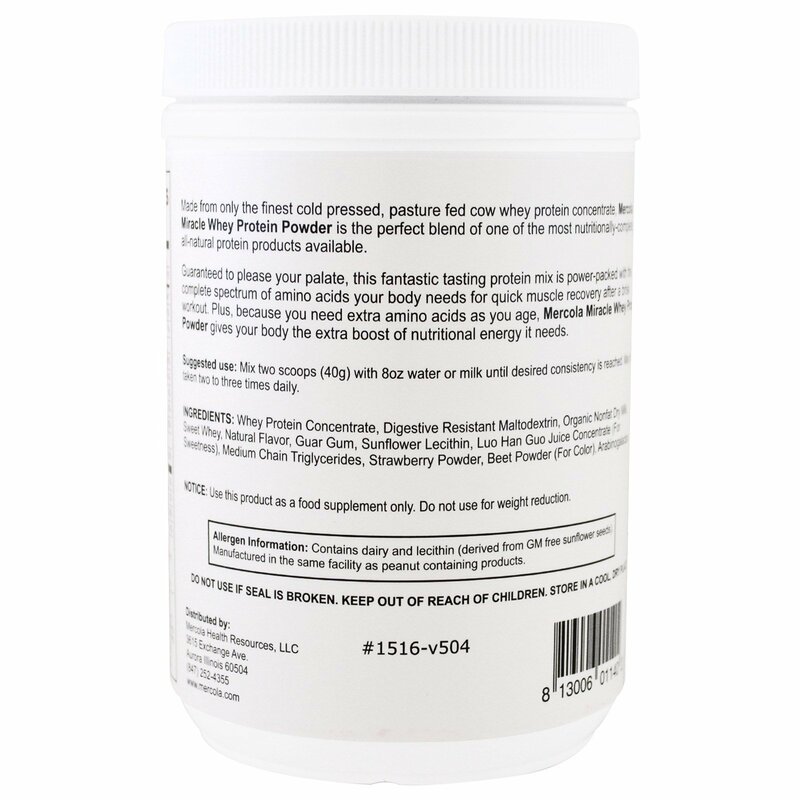 Whey protein concentrate, digestive resistant maltodextrin, organic nonfat dry milk, sweet whey, natural flavor, guar gum, sunflower lecithin, luo han guo juice concentrate (for sweetness), medium chain triglycerides, strawberry powder, beet powder (for color), arabinogalactan. 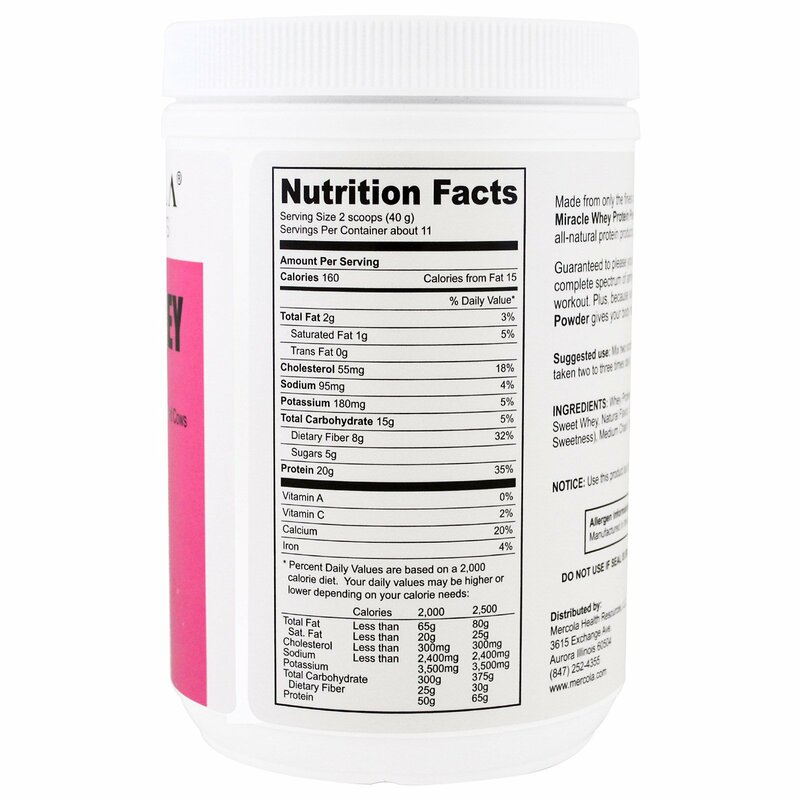 Allergen Information: Contains dairy and lecithin (derived from GM free sunflower seeds). Manufactured in the same facility as peanut containing products. Note: Use this product as a food supplement only. Do not use for weight reduction.